I was recently diagnosed with beta thalassemia minor. My symptoms include chronic fatigue, shortness of breath, and bruising easily. I always thought I was out of shape or lazy because I was constantly napping. I get sick about 2 to 3 times every month. I try to take vitamins daily to boost my energy and immune system. I traveled to Peru before my diagnosis and barely survived because of the high altitude. I thought it was because of anemia, but now I know. I was told about beta thalassemia minor in 2010. Now I know I am the carrier and my son and daughter both have the minor. We are white country folks in South Georgia. Eating Green foods and peas helps with the low energy! The darker the green the better. Turnips, broccoli, cabbage, black-eyed peas, butter beans, foods like this help so much. Be cautious on meat and stay away from processed, sugary, fatty foods. Fish and chicken are good! I lost my gallbladder due to eating meat and sugar for energy. My daughter has beta thalassemia minor. She's 17 and was diagnosed when she was 14. Her main issue is fatigue. She tires quite easily and requires more sleep than most. Unfortunately, with her school workload she doesn't get enough rest at night and this contributes greatly to her lack of energy during the day. She also seems to get sick quite often. I'm not sure if that has anything to do with her thalassemia or just coincidental. My mother has beta thalassemia and is Greek. She suffers from chronic anemia, shortness of breath (SOB), and poor circulation. She does not get headaches. However, there is another condition that is closely related and people can have both; G6PD deficiency. It is an enzyme deficiency that causes sudden anemia, SOB, muscle pain and headaches when exposed to certain triggers, especially fava beans. I inherited this, but not thalassemia. I get lots of headaches when eating certain foods. Please research this. I found out at about 21 years of age that I had thalassemia beta, I am now 38. I have always been tired, pale faced, could run fast and win in sprints but fainted doing a long run at school, and couldn't breathe. I seem to be the only one in my family with it, my brothers won't get tested or have never been told. I have had spontaneous pneumothorax in one lung, my thyroid has stopped working and they cut half out, then 2 weeks later I got hit by a truck, and I have hurt my neck and brain. I now need blood. Actually, patients with minor thalassemia have high RBC (red blood cells), more than usual. This is in contrast with the hemoglobin level and hematocrit. It is just a look at the blood work to suspect thalassemia minor. 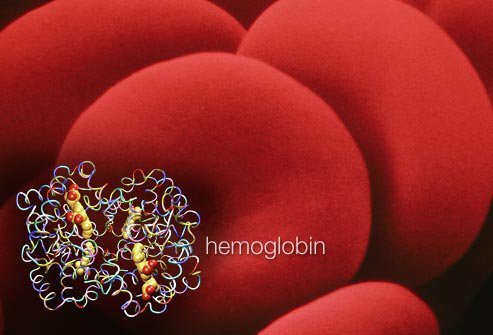 The high RBC is because the RBC in thalassemia patients are of low quality regarding the oxygen transport and the body tries to compensate producing more red blood cells. Then the RBC have a shorter life than in non-thalassemia patients. This will normally increase iron level. I have thalassemia minor. As a child I was always tired and sick a lot. I would take lots of naps. I would also suffer a lot from chest infections that took a while to clear. At 32 I got it 4 times in one year. I knew since birth that I had it because the doctor would always tell me that I had to test my future partner for it because if he had it then our baby would most likely get thalassemia major and our baby would suffer with blood transfusions all of their life. I have noticed that my immune system is always low hence I get sick so often and so easily. I'm 34 now and have had gastroenteritis for 4 weeks and now shingles, which is adult chick pox. I also bruise really easily and when I run I'm so breathless. I don't know what it means in the future but I hope to find a specialist to help me manage it. I was diagnosed with beta thalassemia minor in 1989 when they diagnosed my daughter at age 2. I am prone to being cold even on the hottest day and have aches and pain everywhere. I am tired all the time. My daughter can't handle high altitudes. We both are prone to sudden nose bleeds and bad headaches. Most of the doctors we have seen have never heard of beta thalassemia. I got so frustrated with the doctors not knowing what it was that I now take the dictionary explanation with me to any new doctor. I am a 50 year old male, and in 2016, diagnosed with beta thalassemia (BT) minor when I was 10 years old. Mom is from Iraq, dad was from Lebanon. I was always getting colds and sore throats as a child, and was always cold. I wrestled in high school, and was a top athlete, but when I got tired, I became real tired. I get sick and weak when I travel on long airplane trips, 14 hours or more. I also get sick in Denver or any other place above 3,500 feet. High altitude means less oxygen. I also can't drink alcohol without getting ill. So I avoid alcohol, avoid high elevations, and seek out newer airplanes that pressurize at a feel of 3,000 feet instead of the industry standard of 5,000 feet. I also avoid smokers as that will give me a headache and I take a day to recover. I have never been admitted to a hospital. I avoid processed foods and pace myself as I am active. My mother has this too. She has survived cancer twice in the last 20 years, and was just told by the doctor (she is 84) that her two rounds of chemotherapy may have damaged the bone marrow slightly so that the production of red blood cells may be even more difficult for her. BT minor is not a death sentence, but it is a wakeup call. You simply have to take better care of your health and know your limitations. No smoking, no drinking, no processed food, no lack of exercise (you have to build up your body), and pace yourself. Most importantly you have to educate yourself, as so many doctors and health professionals are not well-versed in this condition. I just learned last year that I have beta thalassemia. My daughter learned she was a carrier only after having her first child six years ago. She also discovered that her husband is a carrier. I have three grandchildren and only the last child does not have beta thalassemia. Here are words of encouragement. As a child I was always cold. I am from the north. I knew I wanted to live some place where it was warm most of the time. I was never sick or in the hospital. I do sports and work out and tell myself not to stop until my mind and body tell me to stop. My family fought off cold, measles and all the childhood things and we survived. Let it be mind over matter. I was a sickly fatigued child and began passing out when my periods started. It was up to me to figure out what was wrong with me when I asked the doctor to put me in the hospital my junior year in high school. He had no clue. A bone marrow test showed I had the thalassemia trait. It was hard news to hear. My hemoglobin stays in the 7 to 8 level and when I was pregnant I had to have transfusions as it dropped below 5. Since menopause has occurred I am usually in the 9s and sometime up to 10. If I get sick, have trauma or even surgery will cause my hemoglobin to drop. The chronic anemia has taken a toll on me. I have chronic headaches, shortness of breath, fatigue, insomnia, body pains and depression. Does any of this sound 'minor'! I wish there was some data to prove minor thalassemia patients that aren't symptom free have lifelong problems that could be managed better if doctors understood the effects on those patients. I am sorry to hear everyone is experiencing these problems with thalassemia. My son has the trait and he has these flu like symptoms every three months, with fever. And he has headaches twice a week. The doctors are saying there is nothing they can do. I feel so sorry for him because he has to go his whole life like this and it seems to get worse as he gets older. How could he have all these symptoms and just has a trait! I thought maybe it was something else like allergies which it can be but the pills do nothing to help. Even painkillers won't help him. And the doctors just recently said it is due to the thalassemia because it happens so often. What if it is something else! I just don't know. He is too young to suffer like this. I have beta thalassemia, but I haven't experienced any of the problems others are saying. I found out about my diagnosis when routine blood work said I was anemic. My dad has beta thalassemia (BT) and growing up, they gave him iron for anemia (thought that was the problem before they figured it out), which made him sicker. So I requested to be tested again and checked for BT, and sure enough, I have it. Still, no problems with fatigue, gall bladder, etc., as others have been saying. Basically found out on a fluke. Thought that might be helpful along with people having some kind of symptoms. You could have it and not even know. I am at a loss to understand why practitioners still only define thalassemia as being only minor and major. I am a thalassemia patient who was diagnosed initially as beta thalassemia minor, but after many years and many health problems; hemoglobin consistently below 7, chronic pain and malabsorption problems, immunity issues leading to severe chest infections, enlarged spleen, and many more. Eventually I was diagnosed as beta thalassemia intermedia. There are many thalassemia patients out there who are somewhere between minor and major who do not get the help needed. Catch up doctors! I was diagnosed with beta thalassemia minor back in college when, after experiencing fatigue, shortness of breath and other signs of anemia (blood tests), my doctor had me tested. I was told by everybody (including doctors and hematologists) that there are no symptoms other than the mild anemia and that there is nothing that can be done. I was taken off my prescription of 3 iron tabs per day. In my early 40s, I was diagnosed with osteoporosis. At 50 I sometimes cannot get out of bed during my period and it seems I have lots of bone/muscle pain. I have always exercised quite frequently, but have now cut back as recovery seems to take much longer. Age related or thalassemia - I think there are more problems cause by the trait than doctors are aware. I was diagnosed with beta thalassemia in the early 1970s, in fact my mother and I were the first Anglo-Saxons in Australia to be diagnosed with this condition. At first the medical profession thought we had lead poisoning because of the odd shape of our red cells. Like others on here, I have suffered all my life with shortness of breath (no heart problems) and fatigue. In my immediate family, my mother, I and one brother have beta thalassemia, and I have passed it on to one daughter. Both Mum, myself and my daughter have had miscarriages and gut issues. Our energy seems to go in spurts, we go okay for a while and then crash. Any viral infection pulls our hemoglobin down lower than normal which is generally around 10.1 to 10.3 but when we"re sick it goes down into the 9s. We all have a bleeding tendency as well. I don"t know if this helps anyone, but I was told never to eat broad beans, perhaps they are too high in iron, and never to take anything that has high levels of iron. Iron tends to deposit in heart, liver and spleen and the body can"t access it. So, it can be potentially dangerous. Before mum was diagnosed she was given Iron injections which made her chronically ill. We now realize why. Not sure whether anyone else has this issue but all four of us also have enlarged livers and enlarged spleens; I don"t quite understand this. My daughter was diagnosed with beta thalassemia when she was 13. She is constantly very fatigued, and has very painful menstrual cramps. I wonder if there is any connection between the blood condition and the menstrual cramps. I am a 68 year old female. I was diagnosed with thalassemia when I had blood work done in my 40s. I was always very active but very tired as well. I also get headaches all the time. I have a hard time sleeping. I also get dizzy spells sometimes especially when in closed areas. As I am aging I feel more tired all the time and have to force myself to get up and about. I am a type A personality and always trying my best to keep active. It is getting more difficult every year. Doctors know very little about this disorder. Thank you and I wish everyone well and to keep up the fight to find some kind of solution to this blood disorder. I am to find out if I have thalassemia, as I am Greek and I hear every 2nd Greek has it. I get breathless in various atmospheric conditions and often tired. I have underactive thyroid discovered when I was 20 which had to be sorted by specialist and to do with not working with my pituitary gland. I think mine would be the minor one if so. I can't do various jobs for long without feeling drained or strange especially in extreme weather conditions. My son was diagnosed with beta thalassemia 2 years ago but this has not stopped him. He is an active teenager, on the swim team in high school, but recently I have noticed he needs to take a power nap after he gets home from school. I wonder if I should make an appointment with a hematologist that knows about thalassemia just to have a baseline. I had my son back in 2004, his pediatrician told us that he had the trait; just that he can't run for long or ever climb mountains. Then I just recently was told that I have a hint of beta thalassemia when I had some lab work done. It has been about 2 weeks now. And since then, I've been getting dizzy a lot more than before. I wonder if that is due to having beta thalassemia. Also, I was told that I have hypothyroid on top of that.